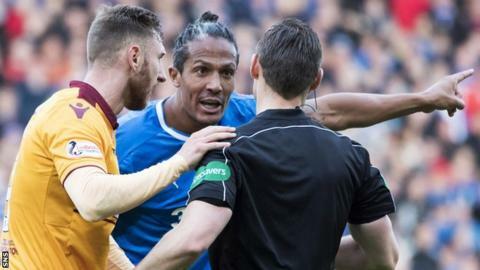 Rangers will appeal against the two-match suspension offered to Bruno Alves by the Scottish FA's compliance officer following Sunday's loss to Motherwell. Alves, 35, was involved in a clash with Well's Louis Moult during Rangers' League Cup semi-final defeat. The SFA's published notice of complaint does not specify exactly which incident the alleged offence relates to. Rangers say it is "inexplicable" that Alves alone has been cited but no Motherwell player has. Ryan Bowman caught Ibrox defender Fabio Cardoso with his elbow during the second half at Hampden, leaving the Portuguese with a broken nose, but will not face any sanctions. Cardoso, too, will not face any action following a first-half clash with Moult. Rangers manager Pedro Caixinha will be offered a one-match touchline ban after being sent to the stand during the game. Motherwell manager Stephen Robinson was also dismissed, but a hearing will be convened to decide his fate because of his previous disciplinary penalties. Rangers say they are "shocked" that Alves is the only player to face a potential sanction, and have called for the disciplinary process to be reworked. "In the minds of all fair-minded followers of football it will be seen as devoid of credibility and balance," the Ibrox side said in a statement. "Rangers are not seeking to make excuses for losing the match. Motherwell played to the referee's whistle. "But there were many aspects of the match which cause concern, both for player safety and the way in which we want to encourage players to play the game. "We do not seek to personalise our criticism. We do, however, have several players injured after the game - one seriously. "Yet, this decision has singled out only one player - a Rangers player - for punishment. Are we being asked to believe just one player was guilty of violent conduct in Sunday's game? "If that is the case, then it is clear Rangers are being assessed to a different standard from others in the Scottish game. "We believe the current system for referring matters to disciplinary tribunals requires radical overhaul. "We do not believe the current referral procedure assists [referees] or benefits the Scottish game. Those of us who care about the Scottish game share an interest in enabling players to play without fear of serious injury, rather than convening, with great solemnity, distinguished panels to adjudicate on matters the players themselves quickly shrug off as handbags." Alves will be available for Rangers' home game against Kilmarnock on Wednesday night, with a disciplinary tribunal to be convened on Thursday to hear the appeal. Rangers' next two games after the visit of Killie are Hearts, at Murrayfield, and Partick Thistle at home.